I have been addicted to rail travel since my first three month Eurailpass in 1978. Trust me, I milked that pass for all the value I could – including riding the night trains back and forward between major cities, so I could sight-see several days in each city, but never pay for accommodation – a vital strategy when one’s guidebook was Arthur Frommer’s Europe on Ten Dollars a Day 🙂. 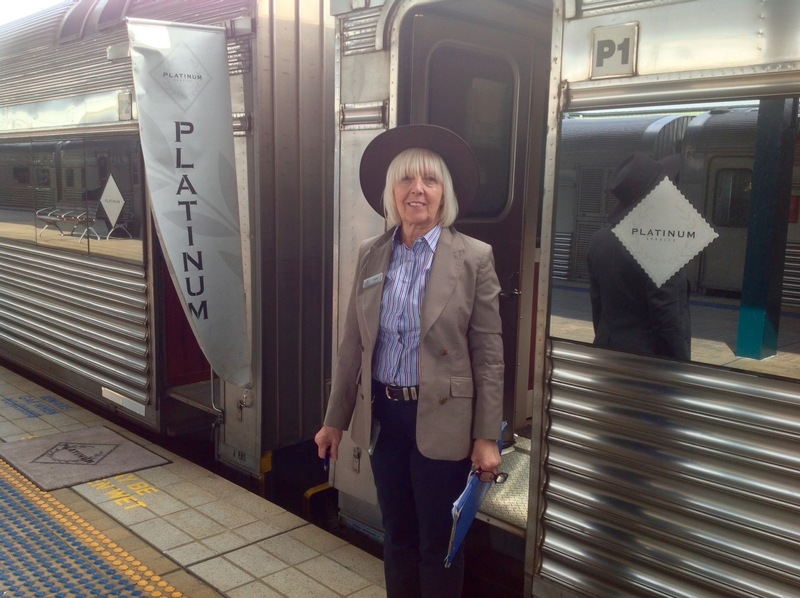 Australia has two iconic rail journeys – The Indian Pacific and The Ghan – and for our most recent holiday, we chose a package that incorporated both of them. So my next series of posts will track that awesome journey. I hope you enjoy. 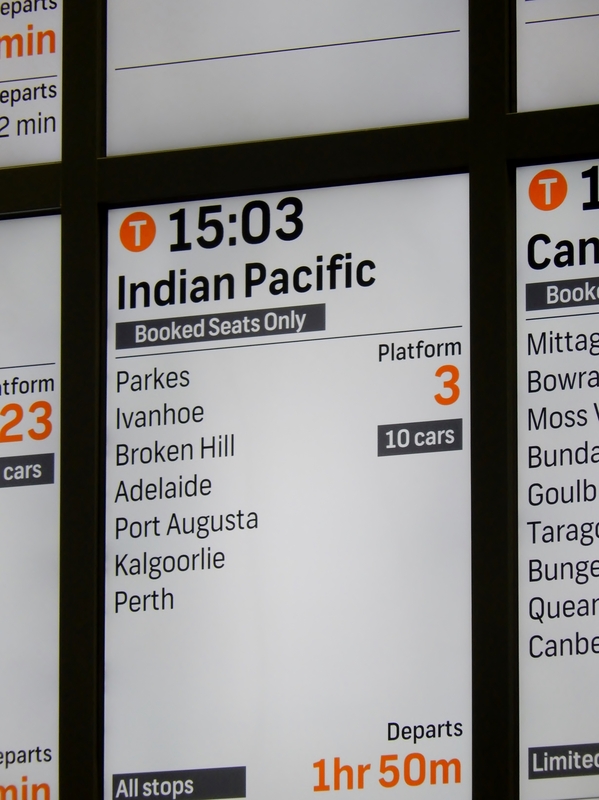 To the uninitiated, the departure board for the Indian Pacific could appear innocuous. A mere seven stops to our destination. Until you consider that Perth is 4325km (2690 mi) away, and to reach there, we will sleep three nights on the train, crossing this vast continent from east coast to west coast, and watching the scenery change from the lushness of the Blue Mountains (our February sojourn) to the barrenness of the Nullarbor Plain. Although a coast-to-coast rail service has existed since 1917, it was not until 1970 that an unbroken line was created. Before that, the track consisted of three rail gauges (broad, standard and narrow). In 1969 a competition to name the new through service was run – and the winner drew on geography, celebrating the linking of Perth on the Indian Ocean with Sydney on the Pacific Ocean. This is a trip we have had on our radar for a long, long time, and we arrive at Sydney’s Central Station in a great state of anticipation. There is a special check-in desk set up at the front of the platform, and after having our arrival recorded, and being issued with our carriage and cabin details, we are directed around to the luggage room to drop off our main luggage. It will be returned to us at destination. On board the train, we only need the equivalent of an airline carry-on bag. Back on the platform, a departure party is in progress. Canapes and mint juleps are passed around by cabin crew dressed in smart country-style uniforms. The train is too long to fit on one platform, so it has been split in two and we are surrounded by carriages as far as the eye can see. A performer sings background songs, a mixture of country, easy-listening and a few of his own. We find out later that Sam is on board with us until Adelaide. A lovely touch. 27 carriages – 2 of which are “Platinum” class, 10 are “Gold” Class twinettes (our class), plus “Red” class reclining seats*, multiple dining and bar carriages, and staff accommodation. * To be phased out from July 2016. Attended by 29 crew members, who will change in Adelaide, (home base of the operator). 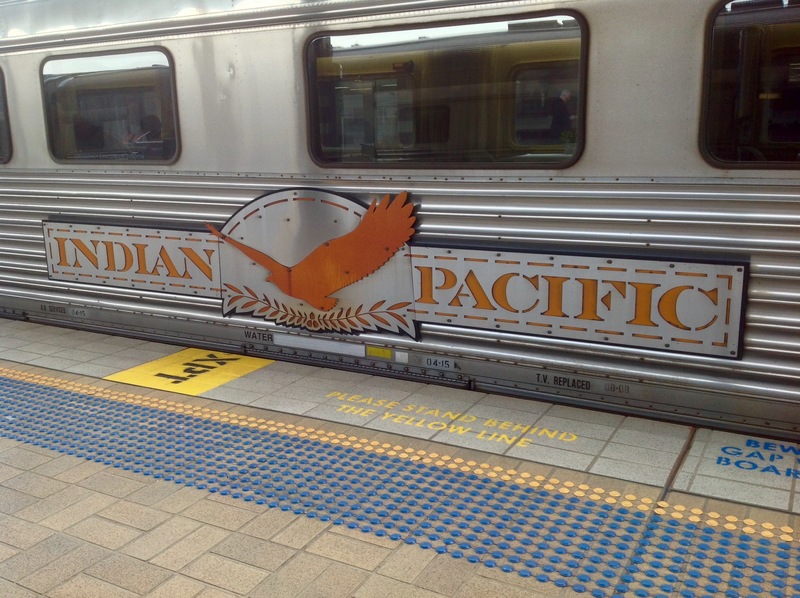 The Indian Pacific is not a new train. International visitors who are used to travelling the French TGV or the Italian FrecciaRossa, or any equivalent of European high speed trains, would be unwise to board expecting a comparison. If you are looking to be transported from one capital city to another within Australia, you will do that much more quickly and cheaply by plane. No. 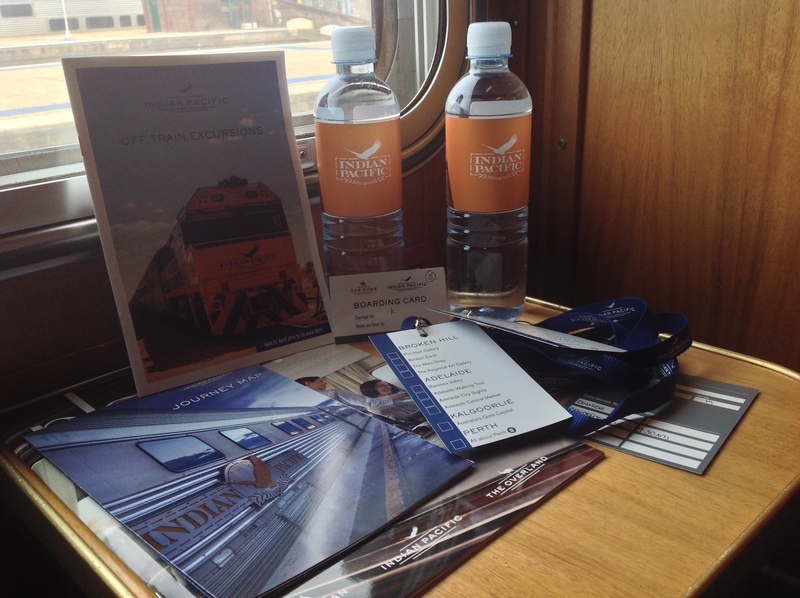 The Indian Pacific is an experience, and the experience begins with your welcome at the carriage door, and continues with the goodies you find inside your cabin.
. . . and then, we are lured to our bar car, to meet some fellow-travellers, and enjoy some of the all-included beverages before a sumptuous three-course dinner. We are travelling in late autumn, and the days are becoming short. I can feel the train straining to pull its load up and across the Blue Mountains, working much harder than the three carriage Explorer we took to Broken Hill in March, but the scenery is already obscured by the rapid twilight. It is dark by 6pm when we come down the other side into Lithgow. Wow, Gwen! What an adventure. Since I am behind on reading posts (as usual) and catching up in a backwards manner (as usual) I had to back up to enjoy your journey in sequence-catching snippets along the way! Onward to the next installment. Such a fun trip! It was such an adventure. So many contrasts. I am having a lot of fun writing about it. But! Glad to be home again. Not in a hurry to leave anytime soon. No place like home! After returning from our last trip, I’m glad to be home for the next 2 months. My wife’s been talking of taking this train ride for the past couple of months; which is really something as she’s not that fond of trains, She reckons that I can do this trip without any trouble, so I’m expecting to get my tavel warrent some time soon. It’s a leisurely journey taken by mostly mature-aged people. You can choose from a range of off-train excursions according to your fitness level, or opt out. Moving around the train is easy enough – even for those with a walking stick, but perhaps a walker would be a challenge. There are plenty of people to meet and talk to, or hole up in your cabin and read or watch the world go by. (No wifi). The single cabins are definitely snug, and share bathroom at the end of each carriage, so I would have a companion and take a twin if possible. It’s not hard to shower on the train, and you would be well used to that, and compact spaces. I think the biggest challenge for you would be the food, but there is a range of choices and you don’t have to eat every course.Some breakfasts I just had a poached egg for example. Or you can just live on the range of fabulous ice-creams 🙂 One upside is that the servings are small and delicate, which may have more visual appeal for your appetite. Unfortunately the pensioner discounts finish at the end of this month (Joe Hockey’s budget dropped the subsidies). I think now the advance purchase and pensioner price are the same. If I did it again, I might choose a time of the year when the daylight hours are longer. Particularly The Ghan, although that would also mean travelling in the wet perhaps? 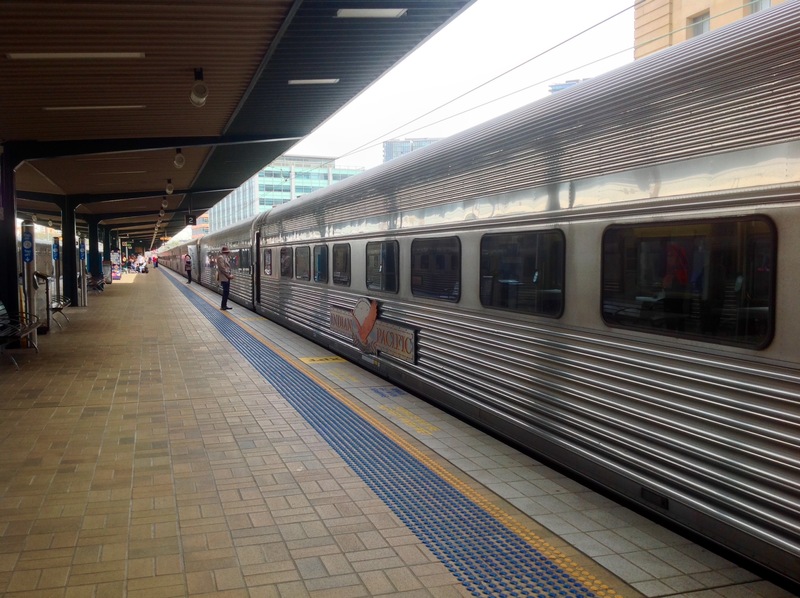 Three nights before Perth – train travel certainly gives you a more realistic experience of a country, especially a continent country like Australia. It’s such an enormous contrast to Europe with all of our little countries. I’m interested in seeing all your pics of how the trip panned out! When I first moved back to Australia, I pined for the variety of culture, cuisine and languages compressed into that same space within Europe. I still do, but not as much. For now, I am just enjoying discovering my own backyard. Oddly enough, the train journey passed quickly! Hundreds of photos to select from to illustrate the whole trip. This will be fun to write about. Many thanks! Lots of stories of Adelaide on the radar! Sounds like a wonderful adventure – though I’d have taken the bottom bunk (less chance of falling out). I preferred not to risk nearly 16 stone of Australian manhood dropping on me, LOL. Actually as I rolled over during the night I remembered I hadn’t pulled up the safety bar. I rectified that quickly! Indeed! So many miles . . . so many stories, and which of the hundreds of photos to choose? It was an incredible trip!